Indian mythology brings us interesting tales about various Gods and Goddesses, their leelas (miracles) and their mission. Most of the major deities belong either to the Shaivite (Lord Shiva's lineage) or the Vaishnavite (Lord Vishnu's lineage) sect. For instance, Lord Ganesha, the Elephant-Headed God and Kartikeya (or Muruga) are the sons of Shiva. Rama and Krishna, on the other hand, are avatars or manifestations of Lord Sri Maha Vishnu. There is one deity, however, who manifested from the united energies of Shiva and Vishnu. He is thus aptly named as Harihara - the son of Hari (Vishnu) and Hara (Shiva). 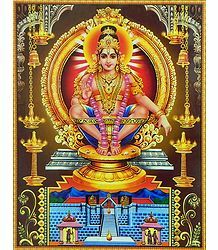 This God, also referred to as Manikanthan, Dharmashastha, Shasthavu or Shastha, is a powerful yogic deity, who is most popularly venerated by devotees coming from the South of India. 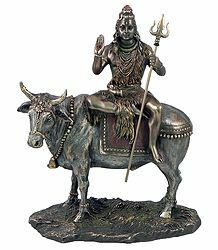 Being the son of Shiva and Vishnu, he is respected by followers of both the sects. Some experts believe that the legend of Shastha was actually an attempt to unite both the cults, by bringing them together in worship. Incidentally, according to both history and mythology, Lord Harihara is the last and only deity belonging to the present-day Kaliyuga. This month, we bring you the story of the Hariharasuta, Lord Ayyappa. Origin of the Name, "Ayyappa"
The origins of the name "Ayyappa" or "Ayyappan" can be traced back right to the beginning of the formation of the sect itself. In South India, the term "Ayyan" is used to address a person with respect. Even today, Tamil people use the word "Ayya" to refer to a person of respect. "Appan" is used to denote "Father". Hence, the term "Ayyappan" refers to a person of great respect, who also acts as a guardian. Some experts aver that the cult of Ayyappa is so ancient that the God represents Nature itself. He is also sometimes referred to as "Ayyanaar". 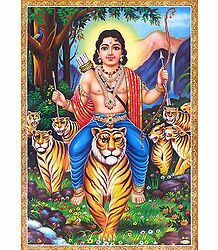 Lord Ayyappa is sometimes portrayed as seated on a tigress, holding a bow and arrow in his hand. At other times, he is also depicted as being seated on a horse; and having three eyes like that of Lord Shiva. Since he is always surrounded by Shiva's Bhutaganas, he is also popularly known as "Bhutanatha" (Lord of the Bhutaganas). His idol, however, is depicted as being seated in a pose called Arddhasana, Yogapadasana or Yogarudha Siddhasana and is in Taopbhava or the mood of extreme asceticism. His knees and back are bound together with the Yogapatta; a sort of tight cloth; and he holds the Yogamudra with his hands. He is a Brahmachari (celibate) and has no consort and sits on a simple peetha. In this pose, his entire persona radiates a calm and serene state of the highest level of self-realization or Sat-Chit-Ananda. While Shastha is largely known to be a celibate God, some say that he has two wives, namely Purna and Pushkala. He is the protector of Dharma (righteousness) and the ultimate goals of Dharma are perfection (Purna) and prosperity (Pushkala). He is also additionally believed to have a son, named Satyaka. Strict adherence to Dharma helps one achieve truth (Satya). This is to symbolize his son, Satyaka. Some argue that Shastha and Ayyappa are two different entities. However, they are generally used synonymously by followers all over the world. The members belonging to the Pandya dynasty, who were ousted by Thirumala Naicker, the king of the erstwhile Pandya Empire, were forced to move away and live in areas such as Tenkasi, Shengottai, Valliyur, Achankovil and Sivagiri. Many of them had established supremacy over certain parts of Travancore and some of these members were handed over the rule of the country of Pandalam by the king of Travancore. King Rajashekara, the foster-father of Harihara, came from this particular dynasty. An able and just ruler, King Rajashekara was well-respected by his subjects. The entire kingdom flourished under his rule and the country experienced a sort of golden age. However, the king had one major sorrow - he was childless and therefore, there was no heir to inherit his throne. He and his wife, both pious souls, kept praying to Lord Shiva for a child. 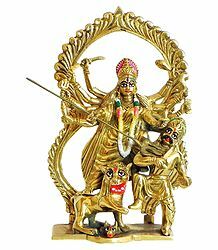 At around the same time, the terrible demoness called Mahishi, performed severe austerities and penance in order to attain the grace of Lord Brahma, the Creator of the Universe. At the behest of the Devas, Devi Parvati had taken the form of Durga (Mahishasuramardhin) and had slain her brother Mahishasura in a fierce battle. Mahishi wanted to avenge the death of her beloved brother. After several months of penance, Lord Brahma finally appeared before her and told her to ask for any boon except immortality. 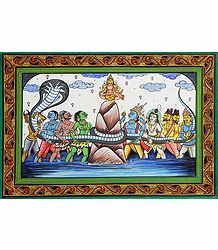 Mahishi thought for a while and prayed that she should attain such powers so that she could be defeated and killed only by a son born out of the union of Shiva and Vishnu. She knew that since both the deities were male, it would be impossible for them to have a child together. In the meantime, a demon king called Bhasmasura performed penance to appease Lord Shiva. When Shiva appeared before him, he asked that whoever he touched should immediately turn to ashes. Once Shiva granted him the boon, Bhasmasura immediately got arrogant and demanded to test the potency of the same on Shiva himself! Realizing his folly, Shiva rushed to Vaikuntha, the abode of Lord Vishnu, asking him to rescue him. Vishnu told him to calm down and took the form of Mohini, a breathtakingly beautiful damsel. 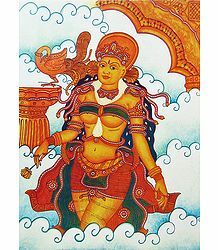 Mohini then proceeds to Earth in order to subdue and kill Bhasmasura. The demon king took one look at the stunning Mohini and fell for her. He came close to her and expressed his desire to marry her. She agreed and asked him to first take a dip in the nearby lake, as she could not marry him in his present shabby condition. He readily agreed and went off to bathe in the lake. Once he came out, Mohini told him that she was very fond of dancing and that she would marry him only and only if he could exactly match all her steps. Though Bhasmasura had never tried dancing before this, he immediately agreed to this condition as well. They danced away for hours on end and the asura managed to match all of Mohini's steps. Mohini was all praise for him and he slowly began to let his guard down. Then, as if posing during dance, she stood with her hand placed on top of her own head. Unmindful of what was happening and only focusing on making her happy, he too struck the same pose, placing his hand on top of his own head. Needless to say, he was immediately burnt down to ashes. In this way, Mohini tricked him into killing himself. There are a couple of versions of this story. According to one legend, when Bhasmasura asked to marry Mohini, she asked him to touch his own head and swear that he would be ever loyal to her and would never even look at another woman in a wrong way. In a bid to please her, he innocently placed his hand over his head and instantly turned to ashes. Yet another version says that, after he took a dip in the lake, Bhasmasura tried to get rid of the excess water in his hair. He ran his fingers over his head and was charred in a mere moment. Shiva saw Vishnu in the avatar of Mohini and was immediately attracted to her beauty and the divine radiance that she emitted. He approached her and united with her. In due course of time, Mohini gave birth to a male child, who was named Dharma Shasta. Shasta grew up in Kailash, the abode of Lord Shiva. He was also referred to as Harihara or Hariharasuta, the Son of Vishnu (Mohini) and Shiva. It was then decided that the child would be placed under the care of Shiva's childless devotee, King Rajashekara of Pandalam. Mohini additionally helped the Devas during the Samudra Manthan episode. While churning the mighty Ocean of Milk, one of the main items that came out was Amrit or the Divine Nectar of Immortality. Since the asuras had assisted the Devas in the process of churning the Ocean, they demanded an equal share of the nectar. Mohini offered to serve the asuras the nectar and made them sit in a line. On the opposite side sat the Devas. She first fed them the nectar and then escaped with the pot of nectar, without letting the asuras get hold of it. On one of his hunting trips into the dense forest area near the Pampa River, king Rajashekara rested on the banks of the river, taking in all the greenery and natural beauty of the place. As he was enjoying the silence, he suddenly heard an infant's wail coming from nearby. He followed the sound and came upon a beautiful child, furiously kicking its arms and legs. On seeing the divine child, the king was overcome with love and wanted to take him home. As he stood there undecided, a sadhu (mendicant) appeared, as if from nowhere, and instructed him to take the child to his palace. He also predicted that the child would end the suffering that the dynasty had so far endured and that, when the boy turned twelve, the king would realize his divinity. Around the child's neck was a gold chain from which was hanging a tiny bell. The sadhu asked the king to hence name him Manikanthan - the one with a golden chain around his neck. Amazed and thrilled to take the little child home, Rajashekara narrated the course of events to his queen. They both knew that Shiva himself had graced them with this radiant little angel in the form of a child. The only one who was not happy was the Diwan of the court, who was hoping to usurp the throne after Rajashekara's time. As a child, Manikanthan was extremely intelligent and precocious. He was naturally inclined towards martial arts and the shastras and often surprised his guru with his sheer brilliance and ability. Once, the boy had placed his hand upon a blind and mute boy's head, immediately bestowing vision and speech upon him. The prince then requested his teacher not to let anyone else know about the incident. Manikanthan's guru then realized that this was no ordinary human being. Upon finishing his studies, Manikanthan went to his guru to offer dakshina and seek his blessings. In the meantime, the queen gave birth to one more male child, who they named Raja Rajan. Ecstatic at the turn of events and sensing that all these miracles were occurring due to Manikanthan's presence in their lives, the king decided that he would be the heir to his throne. Everyone, except the wily Diwan, rejoiced at the king's decision. He despised the boy and devised several plots to kill him. He tried many things and even poisoned the boy's food. The handsome young boy narrowly escaped each time. Finally the Diwan instigated the queen against the boy, telling her that it would be highly improper that Manikanthan succeed Rajashekara, as her own son was alive. He hatched a master plan and told her to feign illness; also assuring her that his personal physician would proclaim that she could be cured only by the application of tigress' milk. They decided to send Manikanthan into the forest to go in search of the milk. There, he would eventually be mauled and killed by wild animals. Even if he somehow managed to return home, he would have failed in his task and this would be a great humiliation to him. The queen agreed to the Diwan's plan and acted as if she was suffering from severe headache. The king's physicians tried their level best, but could not pinpoint the reason for this headache. Eventually, the Diwan's accomplice stated that she could be cured only by the milk of a lactating tigress. Rajashekara was at a loss - it was impossible to procure milk from a tigress. He sent his team of soldiers, but they returned empty-handed. Manikanthan offered to help, but the king could not even imagine doing that. The boy pleaded and pleaded with his foster-father, till the latter finally consented to let him go. The king then bade him goodbye with a heavy, fearful heart. The Panchabhutas of Shiva followed Manikanthan into the forest. On the way, he happened to see the atrocities carried out by Mahishi in Devaloka. Enraged, he attacked her, hurling her onto Earth. A long, bloody battle ensued between them. In the end, Manikanthan mounted Mahishi's chest and broke into a violent dance, which reverberated within Devaloka and the Earth as well. Even the Devas were petrified watching the boy's rage-filled dance. Mahishi; realizing that this was the son of Hari and Hara; humbly prostrated before him, before breathing her last. This terrible dance was witnessed by Shiva and Vishnu from a place called Kalakatti. Following Mahishi's death, Manikanthan entered deep into the forest and had a darshan of Lord Shiva, who blessed him and told him that he had accomplished his divine mission. He still had one task to perform - that of reaching the tigress' milk to the queen. Shiva additionally informed him that he would be assisted in this task by none other than Lord Indra, the King of the Devas. Making his way to Indraloka, Manikanthan asked for his assistance. Indra was more than happy to help. Manikanthan traveled back to Rajashekara's palace, sitting on Indra, who had taken the form of a tiger. They were accompanied by other Devas and Devis who had assumed the forms of tigers and tigresses respectively. When the people of Pandalam saw Manikanthan arriving mounted on a tiger; surrounded by other tigers and tigresses; they got into a panic and hurriedly sought shelter wherever they could. At this time, the sadhu, who had appeared to gift king Rajashekara the child, appeared before everyone and revealed the boy's true, divine identity. Manikanthan reached the palace gates and approached his foster-father, informing him that he could collect all of the tigress' milk that they required to cure the queen of her mysterious ailment. An astounded and completely humbled Rajashekara fell at the boy's feet and begged for his forgiveness. Only now had he seen through his wife's pretence. The boy benevolently smiled at him and left for the forest. That day, Manikanthan turned twelve years old, thus fulfilling the sadhu's prediction. Before he took their leave, the king told the boy that he had decided to punish the evil Diwan, as it was he who was responsible for sending the boy into the forest. However, Manikanthan restrained him and told him that all these incidents were divinely ordained to occur and that no one was really at fault. He also informed his father that, with this, his mission was accomplished and so, it was time for him to head back to Devaloka. He blessed the king and; assuring him that his grace would always be upon him, his family and his kingdom; told him to ask for a boon. Rajashekara expressed his desire to construct a temple in his memory and requested him to suggest a suitable location for the same. Manikanthan aimed an arrow at a place called Sabari. Incidentally, this was the same place where the humble Sabari had fed Lord Sri Rama delicious fruit, when he was in exile. Manikanthan asked the king to build the temple in this location, north of the sacred River Pampa, and also install his moorthi (idol) there. Further, Lord Ayyappa explained in detail as to how the pilgrimage to Sabarimala must be undertaken by devotees; particularly emphasizing the importance of observing the vratham (religious austerities) before beginning the journey to the temple. He additionally narrated the various benefits that devotees would gain after visiting the temple in this manner. Then, blessing the king once again, he disappeared into nothingness. Taking additional advice from Sage Agastya, king Rajashekara laid the foundation stone of the Harihara temple at Sabarimala. In due course of time, Rajashekara completed the constructed of the Ayyappa shrine, along with the sacred eighteen steps leading to the sanctum sanctorum. The idol of Lord Hariharasuta Ayyappa was installed on the day of Makarasankranthi; which falls around the 14th of January every year. Lord Ayyappa had emphatically stated that he would bestow his grace only on devotees who strictly followed the 41-day vratham or penance. This process involves strict abstinence from worldly and sexual desires; following a simple vegetarian diet; leading the life of a brahmachari (celibate), throughout the course of the vratham and focusing on maintaining good thoughts. After these 41 days, when devotees make their way up the steep slopes of Sabarimala, they carry on their heads the irumudi, or a packet, including a three-eyed coconut, an Aantha garland and other simple foodstuff. This is to symbolize the material that the Lord carried with him, when he went into the forest in order to procure the tigress' milk. The devotees then have to bathe in the River Pampa, so as to cleanse themselves of their sins; before proceeding toward the temple complex. Since he is a celibate God, there are some restrictions for women visiting the temple. Only young girls, who have not yet entered puberty; and women, post their menopause; can enter the temple complex. Women of all other ages are barred from carrying out the pilgrimage. This aspect is presently under much controversy, with women from various walks of life challenging the rule; some even going to the extent of visiting the temple during their fertile years. Every year on Makasankranthi day, over 50 million devotees converge from all parts of the world; irrespective of caste or creed; in order to take a glimpse of Lord Dharmashastha. They climb all the way to the top of the steep Sabarimala, constantly doing the saranamvili - chanting the sacred "Swamiye Saranam Ayyappa", singing songs in his praise. On this day, the royal family of Pandalam carries the Thiruvaabharanam or the Jewel Casket of the Lord, from the palace to the Holy Shrine. A Garuda or a Brahaman kite, commonly referred to as the Krishnaparindhu, mysteriously appears, as if from nowhere, and follows the procession carrying the ornaments to the shrine. After the Lord is adorned with the gold jewels, the bird circles the temple thrice and disappears as mysteriously as it materialized. It is said that these ornaments were made to order by king Rajashekara himself. It is kept safely at Srambickal Palace, which is located close ot the Vailyakoikkal Temple, inside the premises of the Palace. At the end of the season, these ornaments are taken back the Srambickal Palace for safe custody. The three caskets carried during the above-mentioned temple procession include the jewels (Thiruvaabharana Petti), silver pooja utensils (Velli Petti) and special flags (Kodi Petti) used at Sabarimala at this time. "Makara" in Sanskrit refers to a zodiac sign, corresponding with Capricorn. "Jyothi" means "Light". Hence, the term "Makara Jyothi" means the "Light of Capricorn". The day the Sun seems to move from one zodiac constellation to another is called Sankranti. Hence, Makara Sankranti day falls on that day of the Makara month and is considered very auspicious according to the Hindu almanac. On this sacred day, many followers of Shasta congregate at Sabarimala in order to have the darshan of the divine Makara Jyothi; a celestial light, which mysteriously appears thrice in the skies, above the Ponnambalamedu hill, situated four kilometers from the temple. The anniversary of this occurrence is termed as Makara Vilakku day. It is believed that on this day, Lord Dharmashastha breaks his penance in order to bless his devotees. The Makara Jyothi phenomenon has been a matter of debate since the last few years, with some challenging the validity of the hallowed celestial light; claiming that it is just a man-made occurrence. These people believe that it is basically a fire lit by adivasis (aboriginals) living in that mountainous region. However, devotees rubbish these claims and continue to throng the temple on Makara Vilakku day. The Pathinettam Padi or Pathinettapadi (18 divine steps), leading to the sanctum sanctorum, have great divine significance to followers of Shastha. Initially, these steps were made of granite and later, were covered with Panchaloha (compound of gold, silver, copper, iron and tin). The first five steps denote the Panchendriyas or the five senses. These symbolize the mortal nature of our beings. The next eight steps symbolize the Ashtaragas or basal emotions of Kama, Krodha, Lobha, Moha, Madha, Maltsarya, Asooya, Dhumb (Love, Anger, Avarice, Lust, Pride, Unhealthy Competition, Jealousy and Boastfulness respectively). The next three steps embody the Trigunas or three qualities of Satva (Piety), Rajas (Enjoyment) and Tamas (Stupor/Corruption). The last two steps represent Vidya (Knowledge) and Avidya (Ignorance). Pilgrims, who undergo the 41-day vratham and carry the irumudi on their heads, have to first place their right leg on the first step. It is said that only after covering all these steps does the devotee detach himself from worldly affairs. Then he becomes fit to take a glimpse of the divine. Before ascending the Pathinettam Padi, devotees break a coconut as an offering to the deity. They have to keep the irumudi on their head while ascending or descending the steps. While descending, devotees have to climb down backwards, facing the sanctum sanctorum - they cannot show their back to the Lord. Ayyappa was a master of the 18 weapons. Before merging with the idol at the sanctum sanctorum, he is believed to have surrendered all his weapons, one by one, at each subsequent step. The steps represent the18 hills surrounding the Sabarimala region, namely, Ponnambalamedu, Gowdenmala, Nagamala, Sundaramala, Chittambalamala, Khalgimala, Mathangamala, Myladummala, Sreepadamala, Devarmala, Nilakkalmala, Thalapparamala, Neelimala, Karimala, Puthuserrymala, Kalakettimala, Inchipparamala and Sabarimala. The number 18 holds great significance to Hinduism. The first Veda has 18 chapters. Veda Vyasa wrote 18 Puranas. The Bhagawad Gita too has 18 chapters. The War of Kurukshetra went on for 18 days. While Sabarimala is the most popular temple dedicated to the worship of Swami Ayyappa, there are some other popular ones too, including Kulathupuzha Sri Shasta temple, Aryankavu Sri Shasta temple, Achankovil Sri Shasta temple and Ponnambalamedu Sri Shasta temple. Shastha Preethi is an ancient ritual carried out to appease Sri Dharmashastha, thus attaining his grace. It is also known by various other names, including Ayyappan Vilakku, Ayyappan Paattu, Shastha Paattu and so on. Here, mass poojas are arranged, inviting people to sing and dance in praise of Lord Ayyappa. Usually, the pooja includes Mahaganapathi Homam, Mahanyasa Japam, Rudrabhishekam, Rudra Kramaarchana, Shastha Avahanam, Ayyappa Sahasranamarchana, Deeparadhana, Chaturvedaparayanam and singing of traditional Ayyappa songs. During the course of this ritual, Lord Shastha and his Parivara Devatas are invoked with lamps. The sthanakaras of Shasta, Chellapalai, Yakshi and Boothathan invoke the divine energy within themselves and act as representatives of the Lord; blessing devotees and sometimes even predicting forthcoming events in their lives. A grand feast is arranged afterward and all are invited to partake of it. Nurani, an agraharam in Palakkad Town, is the most famous for conducting these Shastha Preethi poojas.